Disclaimer: I undertook to write this tutorial more as a collection of thoughts and my own personal experiences. This is neither a recipe for excellent banners, nor a panacea from ugly ones. Consider it a philosophical discourse, perhaps with some practical implications. Like I have said repeatedly, I am not so much interested in gaming as I am in all aspects aesthetical of Warhammer and, more specifically, the Empire. If you are looking for a way to speed-paint, please look elsewhere. If you want to paint and model well, you need to take time and do it without rushing. Banners! We all love seeing beautifully painted banners in miniature units and armies. They add color, character and life to our meticulously assembled and painted creations. They occupy a special place in our armies, in fact, they define their character. How many times have we heard, or muttered to ourselves, “If only I could paint like that!” or “If only I could do that!”, upon seeing yet another masterpiece of a seemingly unreachable level of skill and finesse! Well, it is not unreachable. It is quite within one’s grasp, if only one takes the care to step back, think it through and prepare everything in a calculated and cool manner, rather than slap and smear paint on a banner in a rushed and haphazard way, only to lament own lack of skill later, when faced with… err… the inevitable result. Sometimes, when I see others’ work at the conventions or on the Web, I am genuinely puzzled, I think, “Gee, how did this guy manage to mess it up THIS much? Truly, when I see shoddy work on miniatures or banners, with uneven lines, paint smeared across different color fields, washes gone awry all over or, (the most disturbing) unidentifiable colors (mostly some evil version of brown), I realize time and again something very important: IT IS EASIER TO PAINT WELL THAN TO PAINT BADLY! Indeed, sometimes I see some poor paintjob and it is evident to me that to paint it this badly would have taken an extraordinary amount of time and effort – much less so than to paint it well! It takes time; it takes patience and perseverance, practice and mistakes, which will happen irrespectively of skill level. Even the best miniature painters occasionally mess up their own work, curse, swear, get back and redo. Be ready. Be warned. My primary interests lie with making plastic banners for plastic Warhammer Empire figures (although there is no reason why the same principles could not be applied to other races). I believe they hold some key advantages over both metal and paper ones. 1. They are sturdier than paper banners and will not winkle when transported in a case. 2. 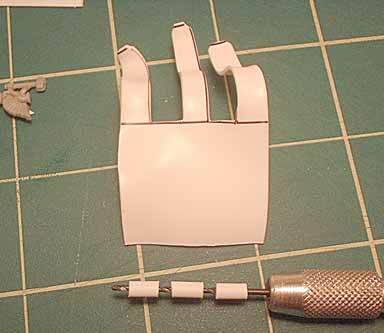 They are lighter than metal foil ones and do not add as much weight to the overall weight of the figure, which is of crucial importance should the figure be accidentally dropped. 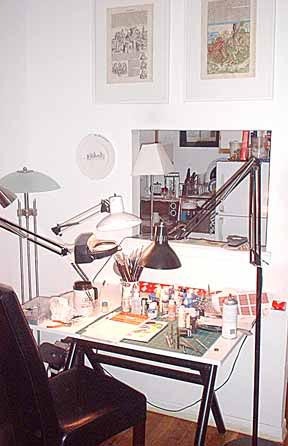 First and foremost, we start with a nice workspace. Very important, your workspace. Make sure you are comfortable, have enough space and have all your familiar tools at hand. They will include a steel ruler, a hobby knife, a hand drill and a Sharpie marker (the kind we use for labeling CDs, the finest tip). Some good music (errr… “good” is relative, I know) will help a great deal. So, how do we start? The answer is simple and straightforward: Plastruct: This product is widely available in the US and I believe you can get it or something like it in other countries in Europe. 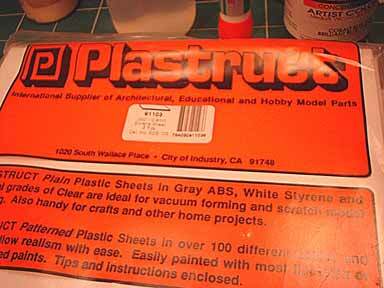 They make a wide range of plastic products for architects, hobbyists and modelers. The number of item we need is: 91103. 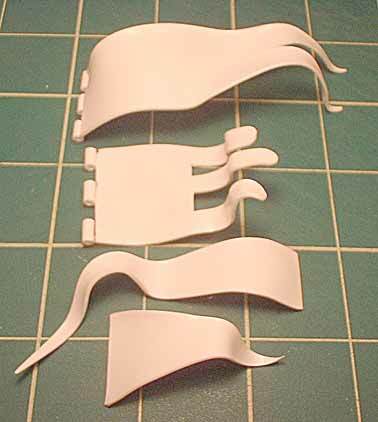 They are hard white plastic sheets, each one just slightly thinner that a GW Empire plastic banner. First, we need to determine the width and the length of the future banner. That is fairly easy – I simply measure how wide the current plastic Empire banner is and make sure the new banner is no wider. It can be longer, or shorter, just keep in mind, that just like with the current plastic banner from the command sprue, the standard bearer will have to be ranked up in a unit. So, while it can be different in shape and length, it should not be too different, both for practical and for aesthetical reasons. Using the finest Sharpie marker, draw the shape of the future banner on the plastic sheet. 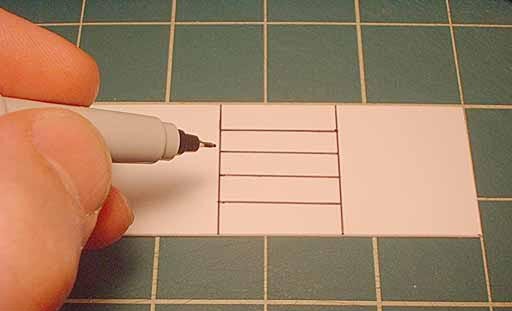 Do not worry about smudging – this is what Sharpie markers are famous for – they dry nearly instantly. And the marker traces will later be covered by paint anyway. I was impressed by the new Bretonnian banner and decided that an Empire unit could benefit from something similar, so I opted for a three-streamer baner. 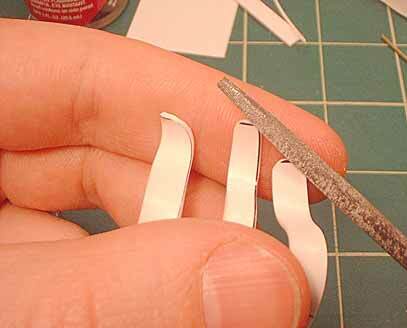 Using a hobby knife carefully cut out the shape of the banner. Steel ruler is your friend – your cuts will be sharp and precise. I also snip off the edges on the three streamers, in order to make the finish more rounded and smooth than just square endings. 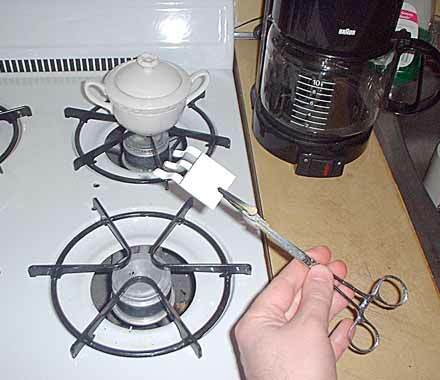 Next is probably the trickiest part of the process. I use my kitchen stove as a source of heat and holding the banner in homemade grips, hold it about 5-6 inches over the flame. You have to observe it very closely, lest it just melts into the flame. You will need to experiment with the distance and timing, but you will see, that the edges of the banner, closest to the flame will start trembling slightly and paradoxically, they will curl slightly upwards in the first fraction of the second, before bending down. This is the moment. Remove the banner and gently (carefully, the edges can be hot) bend it, into the desired shape. Just keep in mind that the shaft side of the banner should remain as flat and as straight as possible for later fixing it to the shaft. We have a decently shaped banner at this point and need to attach it to the banner shaft. 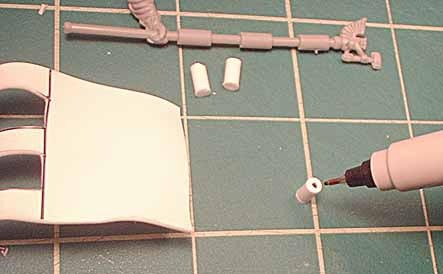 I use Plastruct plastic rods, which are almost the same size as the plastic Empire banner hoist parts attached to the shaft from the sprue. 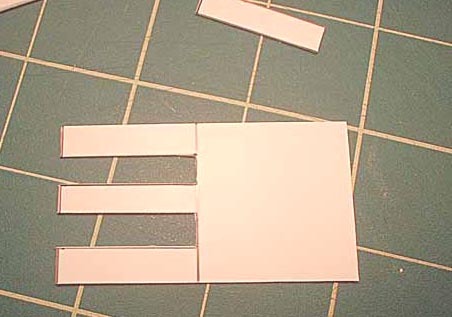 Using a modeling knife, I cut off three pieces of the same length as the banner hoist parts from the box. Using the same Sharpie marker, I mark the center of each piece on both ends, so that I would not have to drill blindly. I drill through all three pieces, one by one, making sure to drill halfway through each, before switching and starting from the other end. This way, the hole will be centered, since the center was marked on both ends. Even if there is a slight shift in direction inside, it will be insignificant. The drill should be about the same size in circumference, or just slightly larger than the brass wire that will later serve as the banner shaft. 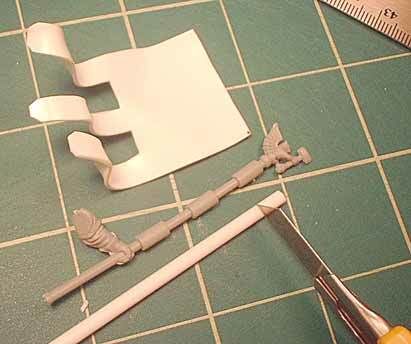 I then just glue the three pieces to the shaft edge of the banner, so it looks much like the standard GW banner. 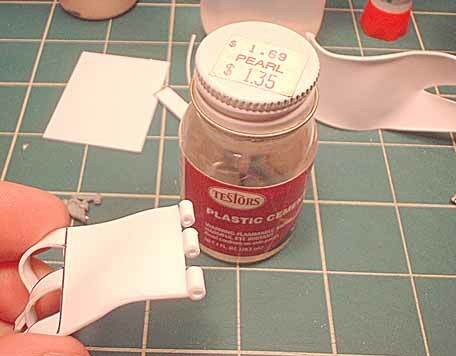 As you can see, I use Testors plastic cement, which is more than adequate for the job; it melts and fuses the plastic together, creating a very strong bond. 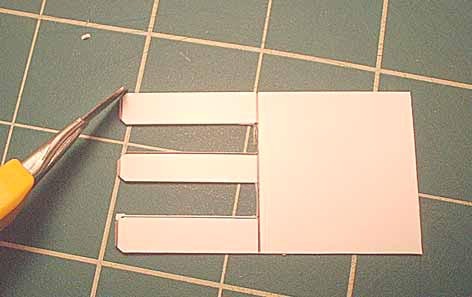 Just like with any gluing, make sure that when you glue two parts of unequal size and weight, even something as light as plastic pieces, always handle your job by the heaviest piece and glue all the others to it. 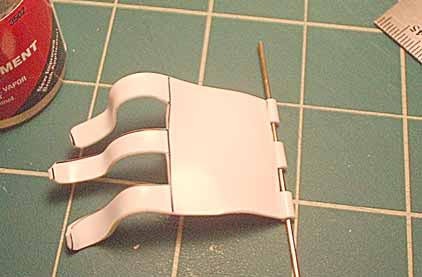 While the glue has not yet set, align the three hoist pieces by inserting a brass wire through them and making sure they line up. 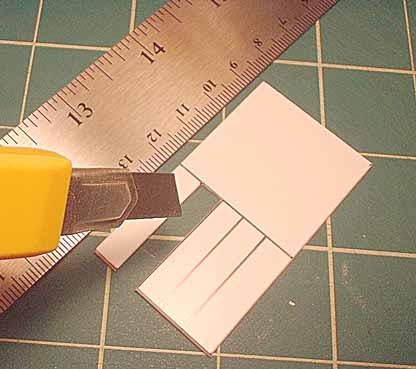 This is why it was important to have this edge as straight and as flat as possible – if it curved too much during heating, it would be next to impossible to align them. 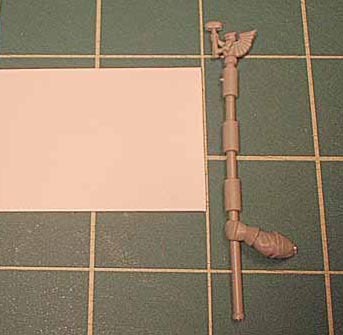 The brass wire will also serve as the banner shaft. At this point I use a fine file and file around the streamer edges, which I had snipped off previously. This will ensure smooth rounded edges, which will be more pleasing to the eye and will be easier to paint, since the paint rubs off easier on sharp edges. At this point the banner is essentially ready. Here you can see the different kinds of plastic banners that can be made using this method. As you can see, the bottom two banners have not yet been finished and need to be made attachable to the shaft.